Know what’s better than drifting along a lazy river in an idyllic vacation destination? Nothing, that’s what! As a hotel pool fanatic, I’m always seeking new pools to add to my family’s must-swim list. I asked some discerning, globetrotting travel bloggers to share their picks for the best hotels with lazy rivers. Of course, I included a few of my favorites as well. 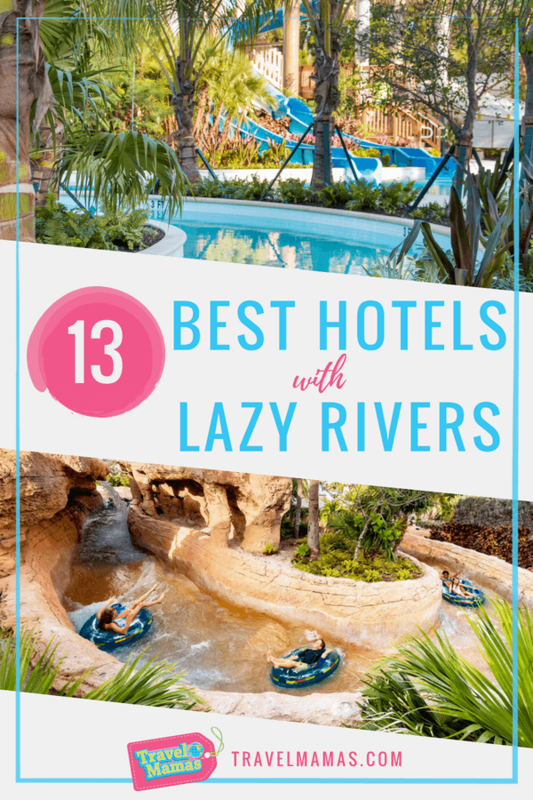 Float along with me as we explore, in no particular order, the 13 best hotels with lazy rivers! The Four Seasons Orlando at Walt Disney World is one of my family’s favorite hotels in the world, and it has our favorite lazy river anywhere. In fact the hotel/pool/kids club/lazy river setup is so great that we’ve been there three times and we still haven’t made it over to the nearby Disney parks! The lazy river itself is never crowded, and the setting is gorgeous as you float around the hotel grounds. I usually try to avoid the waterfalls and people squirting water from above, but my kids love those elements. And even when I’m at the hotel without my kids, I love sitting on a tube and relaxing as the current sends me around, loop after loop. I definitely prefer it to the adult pool that doesn’t go anywhere! 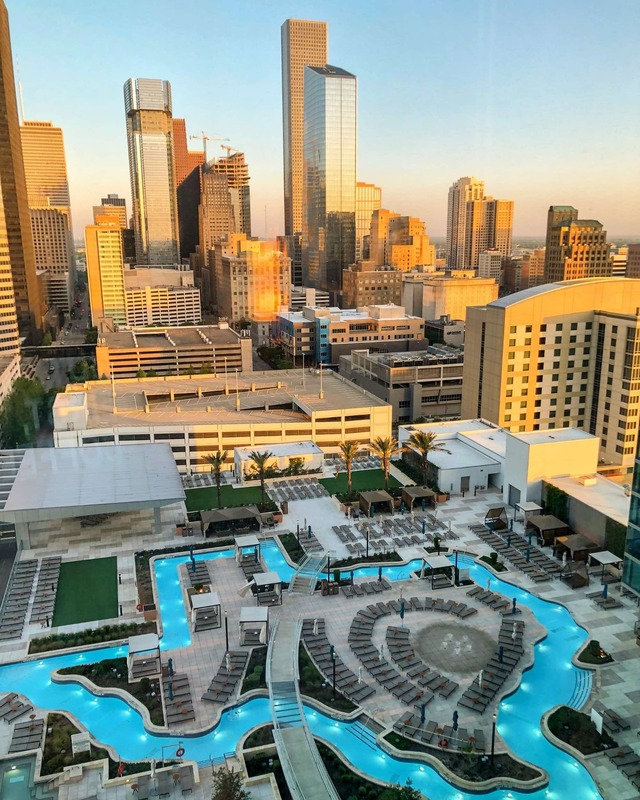 If you’ve ever wanted to swim deep in the heart of Texas, book a family stay at the Marriott Marquis Houston in the city’s downtown core. This luxury hotel property has one of the best lazy river and pool recreation areas to be found anywhere. Here, the design is where it’s at – this long and languid lazy river outlines the shape of the state of Texas, so you’re literally floating around the state, in lazy river form. For the best pool view, book a room on the 17th floor or higher. The rooftop lazy river is not heated, which is actually a blessing given that Houston’s summer heat and humidity can hit 100F+. Grab a float and enjoy a tour around Texas! 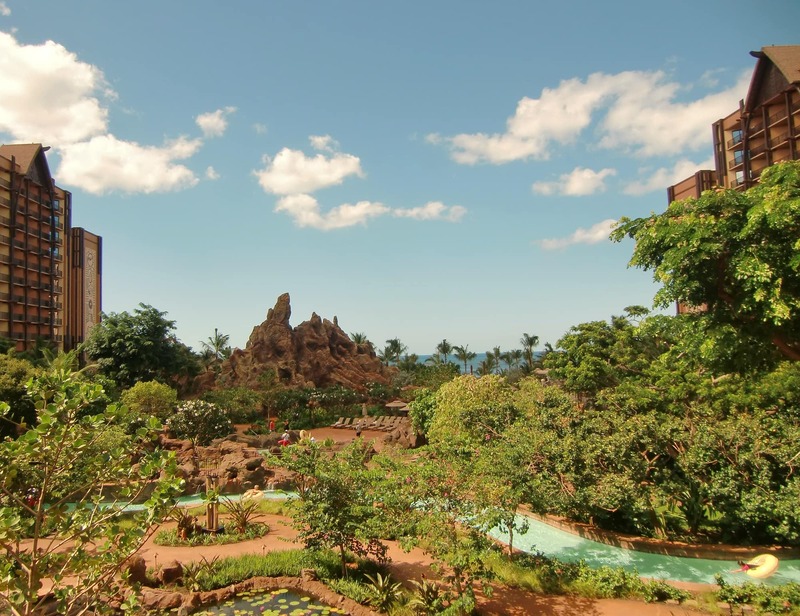 Waikolohe Stream, Aulani‘s lazy river, winds its way through palm trees and sweet-scented tropical plants like plumeria, pikake, and ginger. Playful fountains spray water at riders. (These can be avoided if you choose.) My favorite part is riding through a tunnel in a manmade volcano structure. Bubbles flow up from the river’s floor in this volcanic cave, surprising riders on their first float. Once Hawaii was chosen as the location for the first Disney hotel not adjacent to a theme park, Disney CEO Bob Iger told his staff, “Let’s build the greatest pool in the Hawaiian islands.” He may well have succeeded. 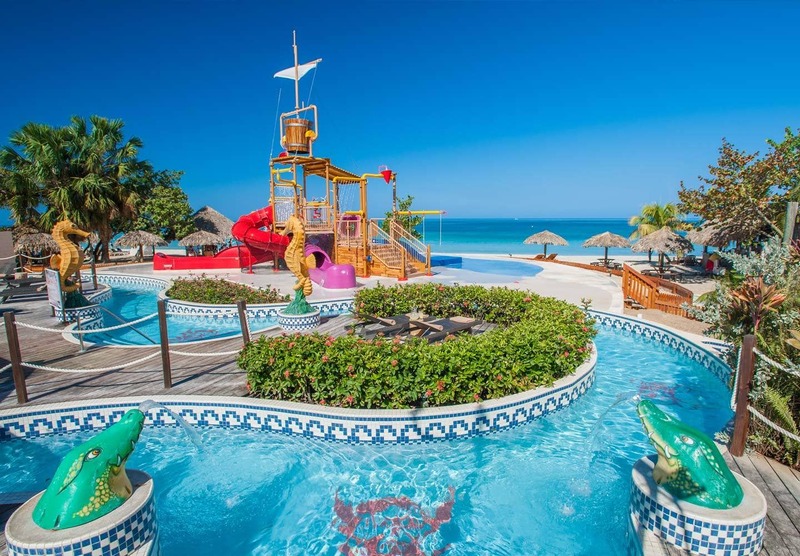 The resort boasts not only an impressive lazy river, but also two splash play zones, two waterslides, four whirlpool spas, a massive zero entry pool, and even a manmade snorkeling lagoon. When is a hotel’s lazy river more than just another hotel’s lazy river? When it’s an ACTUAL river. 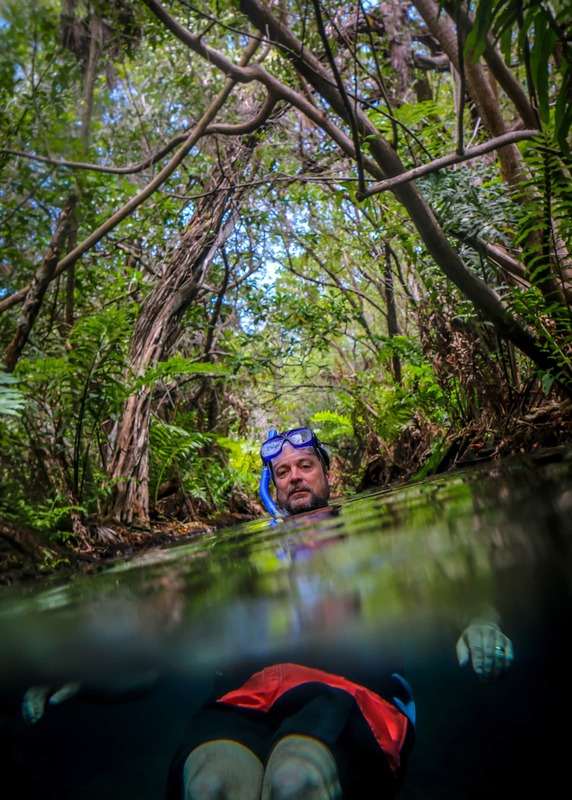 The Rio Selva connects the brilliant blue waters of Cenote Aguila to the Caribbean Sea. It’s part of the Tres Ríos Nature Park at Hacienda Tres Ríos, a surprisingly sustainable all-inclusive resort in Playa del Carmen, Mexico. And trust us when we tell you that it’s amazing! Imagine floating in cool, crystal clear waters through a lush mangrove forest, with schools of fish swimming below you and birds in the trees around you. It’s a gorgeous, tranquil place, and during our float we didn’t see a single other soul. Bliss! Located just north of Naples, Florida we booked the Hyatt Regency Coconut Point to have a family break of solid family fun. This resort didn’t disappoint one bit. 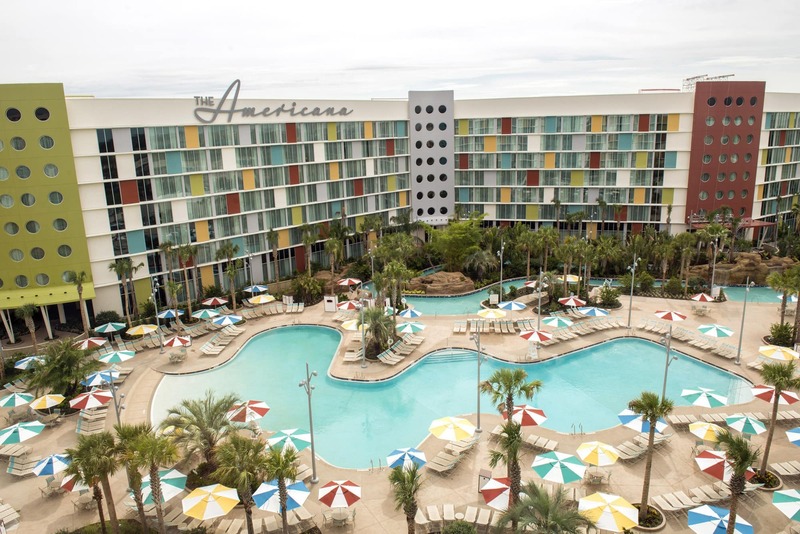 The Hyatt opened an expanded lazy river and water slide complex that includes both a speed slide and a slower one for two people to ride down. We circled the lazy river at least three dozen times. There is a boat service to a private beach for this resort, but the pools were so relaxing and fun, we couldn’t leave them. 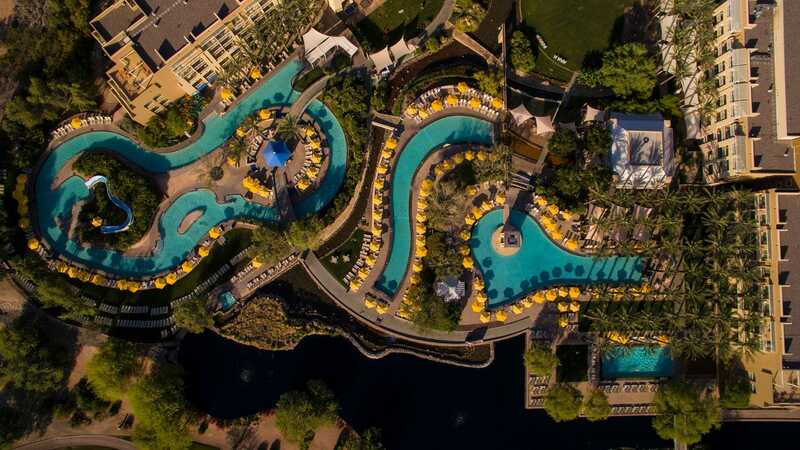 The JW Marriott Phoenix Desert Ridge Resort & Spa is a first-rate resort with an unbelievable pool complex. Four of the resort’s five pools are always heated at 82 degrees, and the lazy river features brightly colored inner tubes and an amazing view of the Sonoran Desert. The property truly caters to all guests and also includes a 36 hole championship golf course, eight tennis courts and Revive Spa. The Shangri-La Bar Al Jissah Resort in Muscat, Oman is a paradise for families. 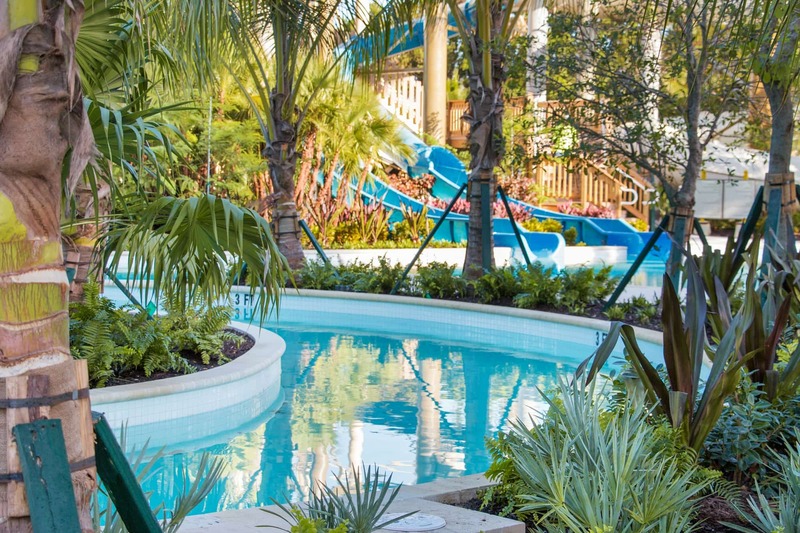 With a private beach, water sports, a kids club, splash pad, multiple pools, and a fabulous lazy river, there is plenty to keep the whole family entertained! There is even a turtle conservation program run by the hotel and if you time your visit right you can watch the hatchlings as they’re released into the sea. 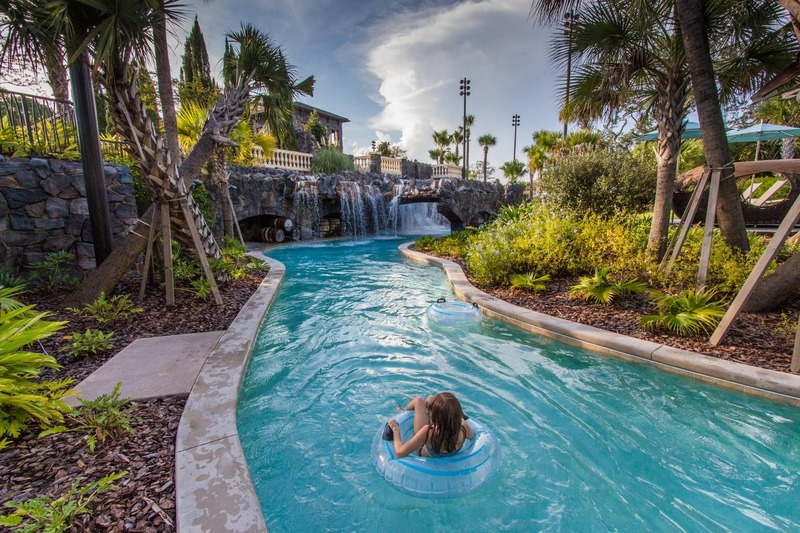 The 1,650 foot lazy river runs from one of the property’s hotels to another so if you want you can just hop on the lazy river and ride it to the hotel next door for a change in restaurants or pools! 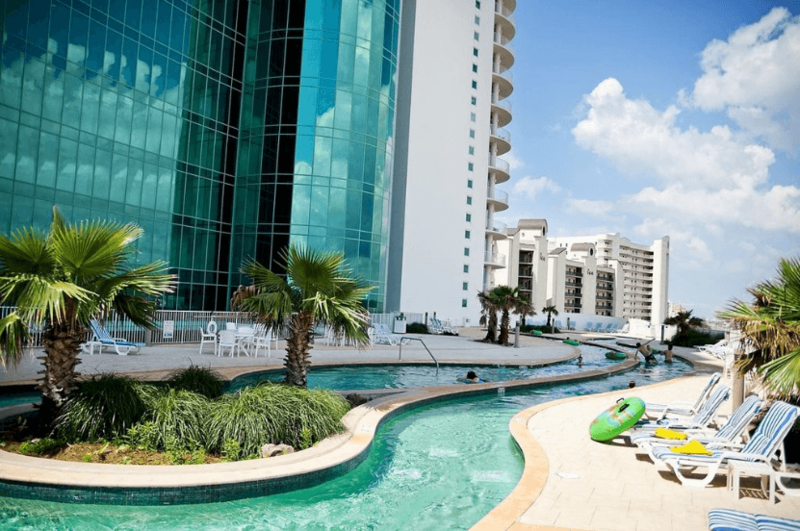 Turquoise Place in Orange Beach, Alabama is a luxury condominium resort that caters to families. Besides the amazing beach just outside the front door, the resort also has several outdoor pools, a huge indoor pool, kids’ playground and game room. Each suite has its own hot tub on the balcony, overlooking the gorgeous gulf waters. The best kept secret is its lazy river, which is tucked away on the fourth floor roof and offers stunning sunset views. Take a book, hop on a float and relax as the day fades away. The Grand Hyatt Kauai is one of the best hotels in Hawaii. The multi-level pools — with salt water lagoon, 150-foot waterslide, and lazy river — are where this property really shines. You can relax the day away floating around the black lava rock-lined lazy river, complete with waterfalls, caves, and seating nooks. While the river doesn’t really flow like many lazy rivers do, there’s ample area to float around and explore. Plus, the views and atmosphere are pure paradise. Pro tip: If you want to forgo paying the fee to rent or buy an inner tube at the resort, make a quick stop at the store to pick up your own before heading to the hotel. History mixed with modern amenities — that’s what families experience when they check into the Omni Homestead Resort in Hot Springs, Virginia. This timeless hotel is a tranquil oasis with natural mineral springs filling its pools. The pool area, called Alleghany Springs, is a two-acre water park with a leisurely 400-foot lazy river, two 100-foot thrilling water slides, a kids water-play zone and sandy beach. 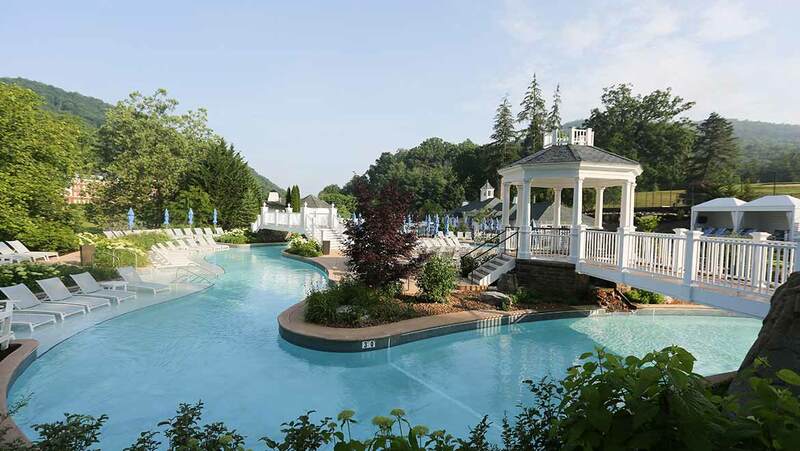 The pool is surrounded by gorgeous views of the Allegheny mountains. Even in the summer, temperatures can be chilly, but the pool is heated for those crisp days. The lazy river and water slides are open daily from 10am to 6pm. Atlantis Paradise Island boasts not one, but two lazy rivers for your floating pleasure. 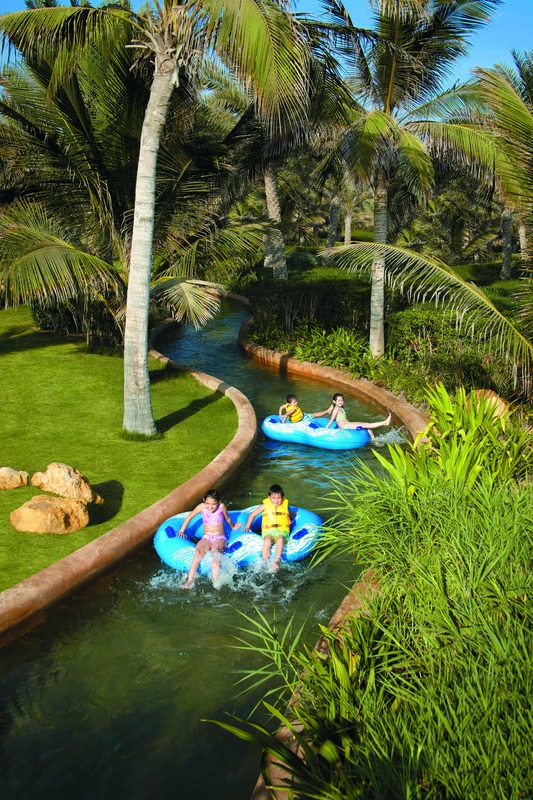 Choose the Lazy River Ride for a relaxing journey along a quarter-mile river. More adventurous resort goers will want to experience The Current — a mile-long inner tube ride that includes water escalators, rolling waves and extreme rapids. Water is the main attraction at Atlantis, with more than 18 waterslides and 11 distinct swimming pools. The fun doesn’t stop there, though. Read about the top 20 things to do at Atlantis Paradise Island. If you love lazy rivers as much as I do (and I think you do! ), then you will want to save this list of the best hotels with lazy rivers. Go ahead and pin the image above for future travel planning! For additional swoon-worthy hotel pools, take a look at the best hotel pools for kids in the USA or this round-up of incredible hotel spa pools. Which of these hotels with lazy rivers looks most dreamy to you? Let us know in the comments below! What an amazing list! Any of these would be a family fun vacation destination. Agreed – you really can’t go wrong with any of these family-friendly hotels! Who wouldn’t love to spend a weekend (or more!) at one of these fabulous places? The Resort and Spa in Hawaii caught my eye! 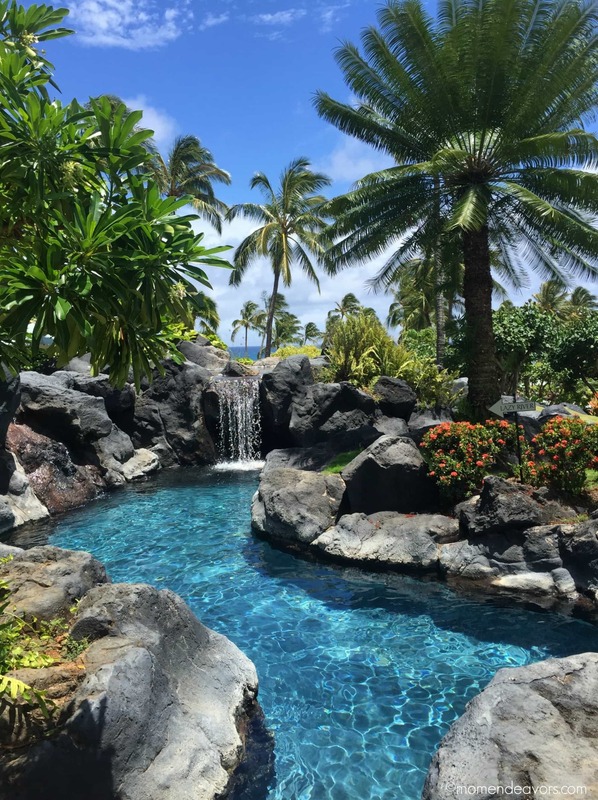 Oh yes, that pool at Grand Hyatt Kauai Resort & Spa does look especially dreamy! Hands up I love a good lazy river, I mean who doesn’t just love relaxing and gently bobbing along. These all sound like some amazing places to go and stay and relax. I am not much for pools, but I can be in a lazy river all day long! I’d be thrilled to have the opportunity to stay at any of these hotels! I can’t think of a better way to while away a day than on a sweet lazy river! I could lazy river it for days on end. All these resorts look so inviting! Seriously…a lazy river at a fab hotel is my happy place! This is a great list! Awesome suggestions! Thank you so much for sharing! Thanks for this list! I love lazy river rides! I have to make it to one of these hotels/resorts this summer. OMG, my inner mermaid is screaming to get out and have some fun! OMG! I gotta hide this list from our son. He LOVES hotels/resorts with great pools & lazy rivers. If he sees this he’ll flip! I love hotels that have Lazy Rivers! I’ve been to one in Palm Springs and loved it. This looks like a great list. Palm Springs really has some incredible hotel pools! These hotels looks so amazing! Hacienda Tres Rios sounds amazing. I would love to float down an actual river and relax! Doesn’t that sound amazing?! Love unique experiences like that!